"DEMOCRATS STAND WITH FOREIGN RIOTERS: But challenge the use of teargas by border patrol agents under attack." But challenge the use of teargas by border patrol agents under attack. My article for FrontPage Magazine today is predicated by the maddening statements of the immigration anarchists that include “journalists” and the increasingly radicalized Democratic Party “leadership” who are attacking valiant members of the U.S. Border Patrol, ICE and other elements of the DHS charged with enforcing and administering our nation’s immigration laws. They actually sided with rioting members of the “Migrant Caravan” who charged the U.S./Mexican border and hurled rocks and bottles on U.S. law enforcement officers who showed great restraint, professionalism and courage in standing up to the assaults, responding with less than lethal teargas to maintain control of the violent and volatile situation to prevent huge numbers of aspiring illegal aliens from violating our borders. America’s borders are its first line of defense and last line of defense against international terrorists and transnational criminals. However, to the immigration anarchists and globalists It is clear that for our borders are an impediment to be overcome at any cost including national security and public safety. Even as the rioters on the dangerous border that is supposed to separate the United States from Mexico, Joaquin “El Chapo” Guzman is on trial for allegedly heading up the extremely violent Mexican Sinaloa Drug Cartel that is alleged to have smuggled more than 200 tons of cocaine into the United States along with huge quantities of other narcotics such as heroin and meth. Clearly these immigration anarchists have chosen sides and they are not on the side of America or Americans or even lawful immigrants. 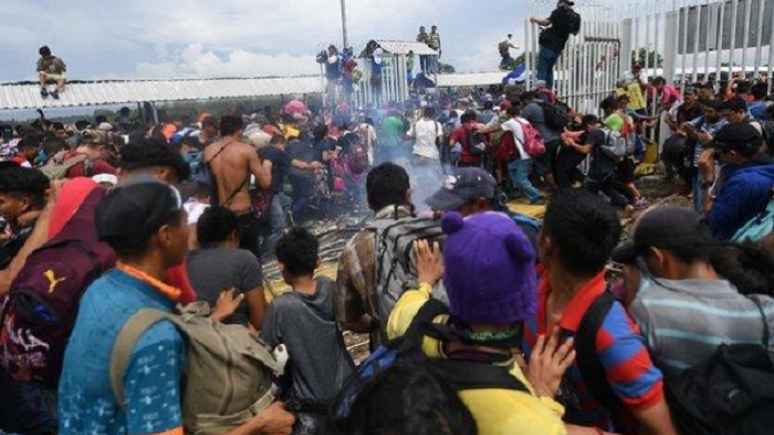 Author MichaelPosted on November 29, 2018 November 29, 2018 Leave a comment on "DEMOCRATS STAND WITH FOREIGN RIOTERS: But challenge the use of teargas by border patrol agents under attack."